The best measurement of NAFTA's effect on the state of Michigan is export data. The anecdotal evidence from firms becomes more powerful in explaining NAFTA's positive effect on the state's economy when it is combined with export figures. This section analyzes total Michigan exports to Canada and Mexico and breaks down exports statewide on an industry-by-industry basis. There are two primary sources of data on Michigan exports: The University of Massachusetts Institute for Social and Economic Research (MISER) and the U. S. Department of Commerce. MISER data go back to 1988, while Commerce Department data go back only to 1993. Both sources are used to evaluate the state's overall change in exports to Mexico and Canada. Both sources are credible; however, they collect export data very differently.44 The Commerce Department counts a company's home headquarters as the source of the export, while MISER counts the point of manufacture, whether in the same state or elsewhere. For instance, a GM automobile assembled in Kentucky and shipped to Mexico would be counted as a Kentucky export by MISER, but also would be considered a Michigan export by the Commerce Department. According to the Commerce Department, 83.3 percent of Michigan industries have experienced increases in exports to Canada since NAFTA began, and 67 percent saw rises in exports to Mexico. This seemingly minor difference can lead to widely divergent numbers for states such as Michigan. MISER data show that Michigan increased exports to Mexico by 375 percent from 1993 to 1997. On the other hand, Department of Commerce data show a far more modest gain of just 15 percent. Likewise, there are differences in the data from 1993 to 1998, with MISER showing a 148-percent gain and Commerce showing a rise of just 40 percent. This same wide divergence is seen in the numbers for Canada, as one source shows Michigan's exports to Canada increasing by 72 percent and the other shows a much smaller 9 percent rise. In other states, the discrepancy is small. For instance, Pennsylvania exports to Mexico after NAFTA's first year increased 31 percent according to MISER and 38 percent according to the Department of Commerce. Exports to Mexico from Texas increased by 53 percent or 47 percent according to MISER and Commerce figures, respectively. The numbers for Texas to Canada are also close, which show increases of 122 percent and 113 percent, respectively. Of the five states we examined in our research, Michigan was the only one with such significant differences between sets of data. This is largely due to the uniqueness of Michigan's auto industry. Few industries ship as many parts and employ as many out-of-state suppliers. No other state has the "Big Three" auto makers headquartered there. Thus, it is understandable that the different means of collecting export data would produce such vastly different figures. Both the Commerce Department and MISER's data are acceptable for use in researchthere is no evidence that one method is better than another. In an interview with the Detroit Free Press, the Mexican ambassador to the United States, Jesus Reyes-Heroles, stated that NAFTA has led to a six-fold increase in exports from Michigan to Mexico since 1993.45 Clearly, he was citing MISER data and ignoring the Commerce Department's much smaller rate.46 We have seen this bias exhibited by both proponents and opponents of NAFTA. To avoid such bias, as well as to provide a complete and accurate picture of NAFTA's effect on Michigan, this report includes both sources of data. Used in tandem, the two sources provide a more complete picture. Ignoring one set of data would not offer a full picture. Of the 50 states, Michigan is Canada's largest trading partner, exporting over $19 billion to Canada in 1998. Michigan's trade with Canada is over three times larger than its trade with its second leading partner, Mexico. Almost three-fourths (70 percent) of Michigan exports are bought by Mexicans and Canadians.47 Michigan's export industry depends on the NAFTA nations. This is especially notable when considering that 15 percent of Michigan's gross state product is from exports. As seen in Charts 3 and 4, below, Michigan exports to Canada and Mexico rose to record levels under NAFTA, annually adding billions of dollars to the state's economy. Although the gains in exports have been impressive, they are not complete without an idea of how Michigan's exports to Mexico and Canada compare to the state's broader export market and to the years prior to NAFTA. Although it is difficult to arrive at definite conclusions from the pattern of Michigan exports to Canada (which had been increasing prior to NAFTA because of a free-trade agreement already in place), the MISER data do show a trend of expansion in exports to Mexico. It is important to note that these data show a 25-percent drop in Michigan's exports to Mexico in the five years prior to NAFTAfrom $1.7 billion in 1989 to $1.3 billion in 1993. Significantly, the value of 1993 exports to Mexico were actually below those of 1988. That $1.3 billion in 1993 increased to $3.2 billion after five years of NAFTA. Taking into account the pre-NAFTA slump, this represents a post-NAFTA rise of 148 percent. According to MISER, Michigan exports to Mexico dropped in three of the four years prior to NAFTA. Post-NAFTA, they have risen steadily each year, even during the 1995 Mexican recession and peso crisis. The state's exports to Mexico increased 18 percent in 1994 and another 104 percent in 1995 (the first two years after NAFTA), compared to decreases of 13 percent in 1992 and 9 percent in 1993 (the last two years before NAFTA). Clearly, Michigan exports to Mexico have made a remarkable turnaround since NAFTA. For Michigan's exports to Canada, the Commerce Department shows a 72-percent gain since NAFTA, and MISER shows a 9-percent rise. MISER lists a 19-percent increase in the five years prior to NAFTA. MISER data show increases in four of the five years after NAFTA and drops in three of the five years prior to NAFTA. It is important to note that trade liberalization between Michigan and Canada actually began after the 1989 Canada-U.S. 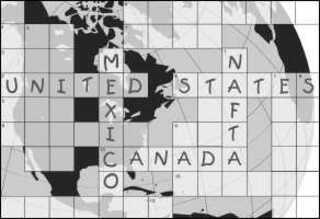 Free-Trade Agreement and merely continued under NAFTA. Thus, the type of five-year comparisons made between Michigan and Mexico should be viewed differently than the comparisons made between Michigan and Canada. The results are mixed when comparing Michigan's exports to Mexico and Canada to its exports to the world as a whole over the same period. According to MISER data, Michigan's 148-percent increase in exports to Mexico was nearly six times higher than its 25-percent increase in exports to the world as a whole. The 9-percent increase in exports to Canada, however, was almost one-third less than exports to the world as a whole. According to Commerce data, exports to Mexico increased by 40 percent, to the world as a whole by 55 percent, and to Canada by 72 percent. Table 3, below, compares Michigan exports to non-NAFTA and NAFTA nations using both longer-term MISER data as well as Commerce Department figures. As might be expected for Michigan, the Commerce Department data show a very different result than that showed by MISER. While Commerce does not offer data back to 1988, it shows that Michigan exports to the NAFTA nations since 1993 have exceeded those to the rest of the world over that period. The Commerce Department data also show the increase in Michigan exports to the NAFTA nations exceeding the increase to the non-NAFTA nations by 20 percent. It is also illuminating to show the trends in Michigan exports to the NAFTA and non-NAFTA nations (i.e., "rest of the world") in the five years before and after NAFTA. According to MISER, in the five years prior to NAFTA, Michigan's combined exports to Mexico and Canada increased by 13 percent.48 This is well behind its exports to the non-NAFTA nations in the rest of the world, which increased by 44 percent. While post-NAFTA exports to the NAFTA nations have not caught pace with those to the non-NAFTA nations, they have increased more post-NAFTA, at 19 percent, than pre-NAFTA, at 13 percent. This contrasts with the pattern for exports to the non-NAFTA nations, which stayed nearly constant over the pre- and post-NAFTA periods. While the discrepancy between Commerce figures and MISER is once again frustrating, both sets of data illustrate results that reflect positively on NAFTA, rather than negatively. For instance, the post-NAFTA increases exceeded the pre-NAFTA increases by wide margins. Indeed, even the more conservative MISER data show impressive increases in exports from Michigan to NAFTA and non-NAFTA nations. The next level of analysis examines export statistics by industry group in Michigan. The Department of Commerce uses the Standard Industrial Classifications (SIC) to break down exported goods by industry.49 SIC codes classify businesses by industry and economic activity. This section employs only the much more conservative Commerce Department data. A wide range of Michigan industries have experienced an increase in exports. According to the Commerce Department, 25 of 30, or 83.3 percent, of Michigan industries have experienced increases in exports to Canada since NAFTA began, and 20 of 30, or 67 percent, saw rises in exports to Mexico. Despite the robust trade with Canada prior to NAFTA, 11 of the 25 industries that showed an increase in exports to Canada experienced double-digit increases, and eight sectors saw triple-digit increases, after NAFTA took effect. Of the exports to Mexico, there were eight double-digit increases, seven triple-digit increases, and an astounding rise of over 5,000 percent in the scrap metal industry. Thus, of the 20 industries with export gains to Mexico, 16 were double or triple-digit increases. Most important to Michigan are the healthy gains in the transportation industry. Despite being hit hard by the 1995 peso crisis, the sector has steadily grown in Mexico, with Michigan recording a 36.2-percent export gain since 1993. (The gain is even higher using MISER data.) The crucial auto trade with Canada has fared even better. Prior to NAFTA in 1993, Michigan exported $6.25 billion to Canada in the transportation sector. As of 1997, that figure had grown to $11.77 billion, a rise of 88.5 percent. Table 4 shows that Michigan exports were affected across the board by the Mexican recession in 1995. The severity of that event cannot be ignored. Trade began to recover in 1996 and, in most cases, was back above previous levels by 1997. It is remarkable that the numbers rebounded so quickly. One area of stellar growth for Michigan exports to Mexico was the agriculture industry, which has increased exports by 935 percent in the years since NAFTA went into effect. Table 5 shows that exports to Canada have grown for an even broader spectrum of industries. Most notable are the exports in the metallic ores and concentrates, which increased by 1,325.4 percent; forestry, which increased by 357.4 percent; scientific and measuring instruments, which increased by 301.1 percent; apparel, which increased by 329.4 percent, and chemical products, which increased by 272.2 percent. Industries that have experienced the largest export drops since NAFTA's passage include livestock, down 69.1 percent; fabricated metal, down 53.8 percent; and fish and marine products, down 42.3 percent.